Home > Live Jazz Shows > Gene Bertoncini with Doug Richeson at Bungalow Jazz..
Gene Bertoncini with Doug Richeson at Bungalow Jazz.. 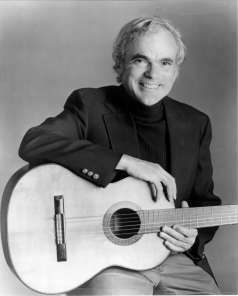 This Thursday, November 4th, we will be treated to the jazz guitar mastery of guitarist, Gene Bertoncini. The performance will take place at Becky Ogden’s 5th Avenue Bungalow, otherwise known as Bungalow Jazz. Joining Gene Bertoncini is local bass player, Doug Richeson. Show time is at 8:30pm. Over decades, Gene Bertoncini has firmly established himself as one of the most eloquent and versatile masters of the guitar. With elegance and ease, he bridges jazz, classical, pop, and bossa nova styles, integrating his own spontaneous and tasteful improvisations along the way. He has earned highest critical acclaim for his artistry on both the classical and electric guitar. He describes his architectural experience as something which gives his music its finely-wrought form and style. He wins continual praise for the superb structure of his arrangements and improvisations which serve as a vehicle for his virtuosic technique. Mr. Richeson lives near Columbus, Ohio. He freelances Nationally and Internationally as a musician and teacher of Classical, Jazz and Contemporary Music on his instruments, the String Bass and Electric Bass. He has recorded on several recordings, performing on Electric and String Bass. Performing in a variety of venues with many jazz greats, to name a few: Tony Bennett, Ralph Sharon, Count Basie Orchestra with Tony Bennett, Phil Collins Big Band with Quincy Jones, Gene Bertoncini, Bucky Pizzarelli, Frank Vignola, Jimmy Heath, Jack Jones, Sammy Nestico with the Cleveland Jazz Orchestra, Columbus Jazz Orchestra musical director Byron Stripling, Newark – Granville Symphony Orchestra with Musical Director Tim Weiss and many more. Mr. Richeson was the Bass Instructor at Capital University, Conservatory of Music 1987-93. Summer of 1999 and 2006 he was the Guest Jazz Bass Clinician at the American School of Double Bass. He is currently teaching Classical and Jazz Bass at Denison University, School of Music.